Here's a quick Wordcloud created from the draft Neighbourhood Plan for Poringland. 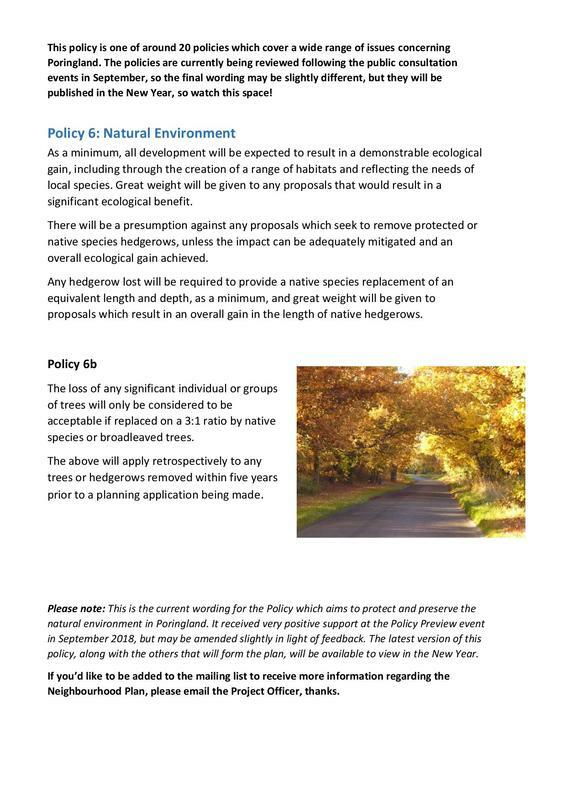 Given this is based on feedback received from the community on issues that are important to them, we are pleased to see HEDGEHOGS appearing! The Plan will be available to review and give feedback on in the New Year. How can a Neighbourhood Plan protect and preserve our trees and hedgerows? 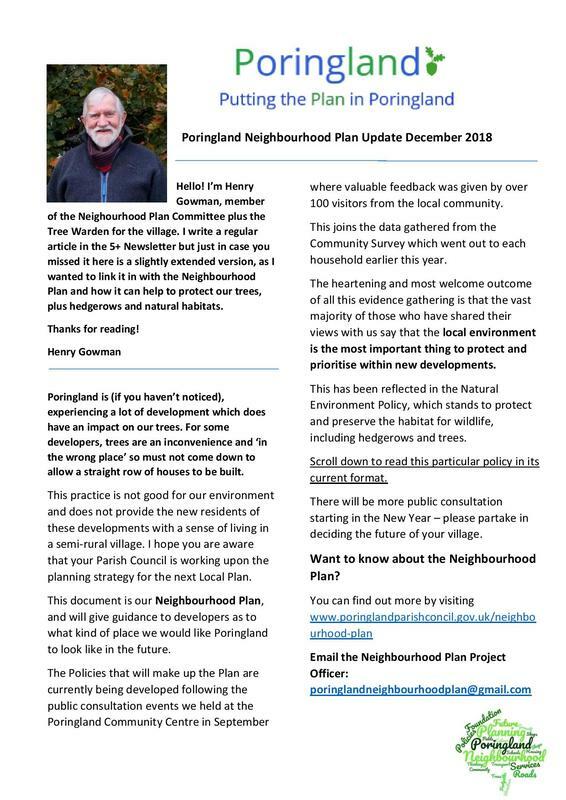 Found out from Henry Gowman, Neighbourhood Plan committee member and your local Tree Warden. Click here to read his article, or scroll down. Click here to read the latest update from John Joyce, our Vice Chairman, or scroll down to view. It gives a useful overview of where we are now, and what lies ahead. Here's a quick info overview of the survey findings - thanks to those that took part, the results are reflected in the policies that are currently be drafted. Thank you to everyone who came along to our Policy Preview events in September. 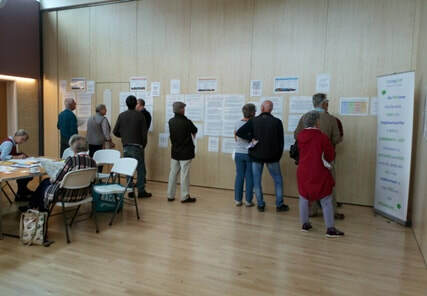 We had over 100 people come along to read and give feedback on our draft Policies. This was shared with the Neighbourhood Plan Committee at their last meeting on Wednesday 17th October. This feedback is important as it helps us to ensure the Plan reflects what the local community has said it wants, and doesn't want, for this area. If you would like to view the first version of the Policies (which are currently being amended to reflect feedback), then please click here. A newsletter has also been produced, giving you a quick 'at a glance' update on progress so far ... read it here. The Designated Neighbourhood Area sits only within the parish boundary of Poringland and does not include Framingham Earl, Stoke Holy Cross or Caistor St Edmund. In 2013 and again in 2015 all of the parishes carefully considered whether they wished to undertake a joint Neighbourhood Plan, with the decision made that this would not be progressed. 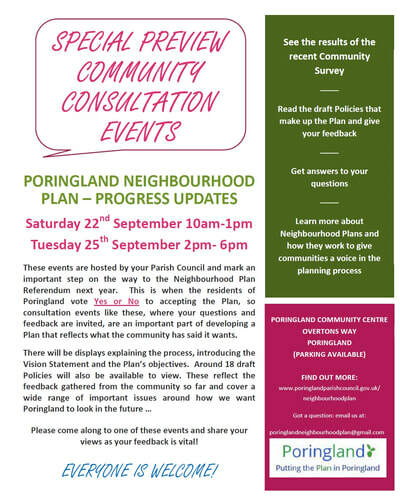 Poringland Parish Council is keen to undertake a plan in order to better influence the planning process, and has decided to go ahead alone. 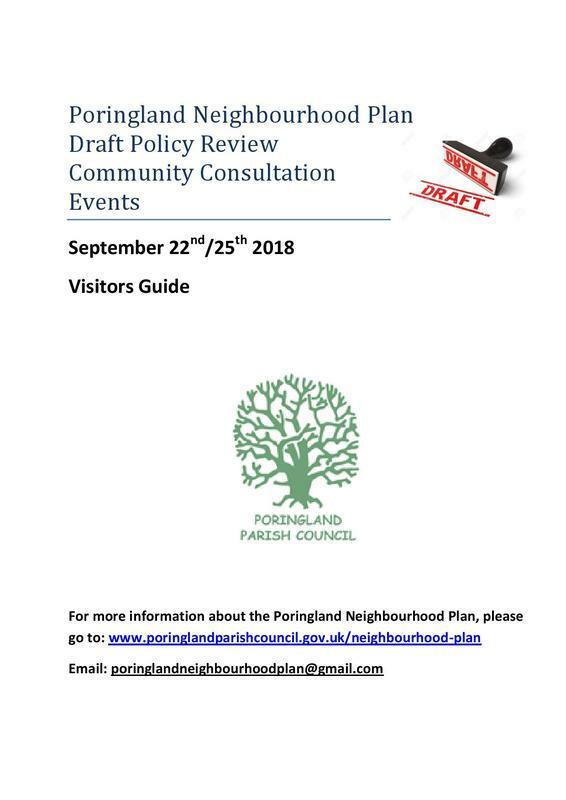 While residents of Framingham Earl, Stoke Holy Cross and Caistor St Edmund are welcome to participate in the consultation process, any comments relating specifically to areas outside of the Poringland parish boundaries cannot be included, and residents of those parishes will not be entitled to a vote in the referendum. The map across shows the parish boundaries, and further detailed information on the parish boundaries is available from the Parish Clerk. 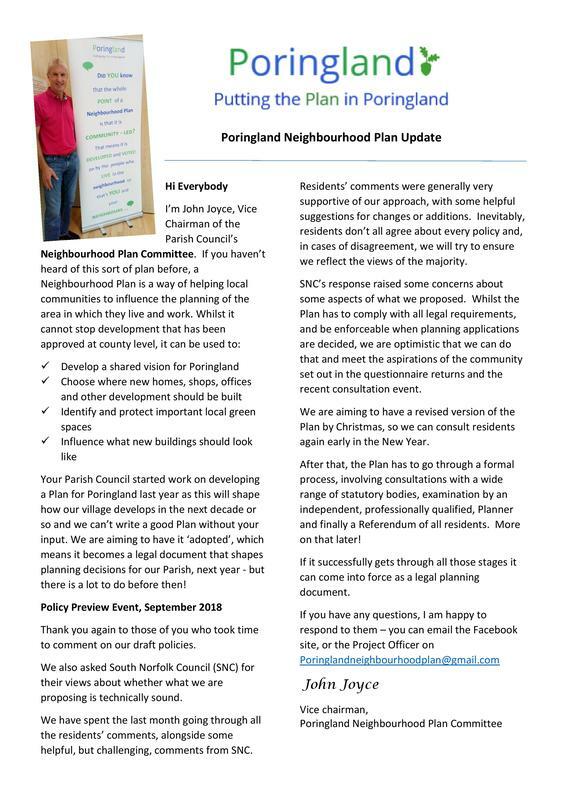 from 2017: Poringland Parish Council is developing a Neighbourhood Plan. This is a community project which allows you, the residents of Poringland, to decide what you want your village to look like in years to come. Neighbourhood Planning cannot stop development - but it can make a statutory plan which must be taken into account when any planning application - large or small - is considered. The process will formally begin in October 2017, and we will be giving regular updates through this website; social media; email; newsletters; and direct mailings. There will be regular public consultations to help us develop the right policies and Plan. We will make sure you know where we are in the process. And ultimately, you will have your say about whether you accept the Plan through a referendum. This is a community project. And we want you on board. You don't have to have any planning expertise, you just need to be passionate about Poringland, and able to commit to one meeting per month. The administrative work will be carried out by staff employed by the Parish Council, and we will be engaging a consultant to make sure that our policies are well written using planning terminology.